I recently visited The Sonoma Grille on Penn Ave in the cultural district for a sampling of their finest dishes. Sonoma General Manager Randy Wright was friendly and visibly passionate about his chef's offerings. The restaurant's tagline is "a meal without wine is like a day without sunshine" and this statement resonated through out the dining area which made me feel like I was enjoying aNapa Valley sunset. Farm to Table, and more! I had the pleasure of attending the Farm to Table conference a few weeks ago where several of the area's farms and natural food companies were represented, showing off their goods. Let me highlight a few of my favorite organizations represented at the event: The Green Chef PA is a collection of four lovely women based in Sewickley who are on a mission to change the way people think about, shop for and prepare food. They were preparing a few of their favorite fresh and fast treats for the crowd to munch on while they were checking out the event. 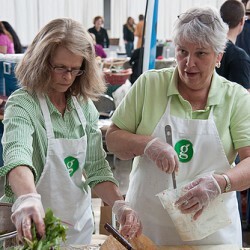 They offer catering, personal chef services, instruction and gardening resources. Everything they make is prepared from scratch and made with the freshest local ingredients possible. Buy Fresh Buy Local is a lovely website devoted to being a central resource for over a thousand places to find local food in Pennsylvania. I recently visited Seviche for a tasting of their finest offerings during a warm Pittsburgh spring evening. During happy hour, Seviche offers a special menu with select tapas for $5, select glasses of wine for $4, special cocktails (including mojitos) for $5 and Latino beer for $3. Seviche also has Chickita Tuesdays when all ladies get their first drink on the house, all day long. Seviche's mojito selection is crisp and refreshing; I enjoyed the Seviche Mojito Classico, made with Bacardi Superior rum, muddled mint, fresh lime juice, mint infused simple syrup and a splash of soda. They also have peach, key lime, mango, mixed berry, and banana flavored mojitos. I don’t need to tell you that Pittsburgh is a city on the brink. We’re a breeding ground for startups, a few plots of land away from full riverfront development, and we’ve got a plethora of thriving local businesses. Our vibrant and passionate community is what makes these things possible. A community of connected individuals, young professionals, investors, and concerned citizens who have the power to make things happen just by the click of a mouse is a revolution; and it’s happening in Pittsburgh. Why not take it to the next level?